I was originally going to post something else today, and I still plan to post that recipe because it was great, but I thought you needed to know about these cookies sooner rather than later. I am a total sucker for chocolate chip cookies. All self control is out the window when they (or the dough) are around. I already have a go-to recipe but I’m always up for trying something new, especially when there is an unexpected ingredient. And when I say “always” you can take that literally. I saw this recipe in the morning, the corn starch caught my eye, and the first dozen were in the oven before lunch. I think it’s safe to say that my old stand-by now has some stiff competition. These cookies were exactly what I hoped they would be. Chewy, flavorful, just slightly crunchy around the edges. And I know that taste is what should matter the most, but I like my cookies to look as good as they taste. These cookies keep their round even shape, puff up nicely in the middle, and don’t spread too much. Basically, they are everything I am looking for in a cookie. In the bowl of a standing mixer fitted with a paddle attachment, cream together the butter and sugars until light and fluffy. Scrape down the sides of the bowl then add the egg and vanilla and mix until well combined. Drop rounded tablespoons of dough, or with cookie scoop, onto a prepared baking sheet. Bake for 8-10 minutes, until barely golden brown around the edges. Let the cookies cool on the cookie sheet for five minutes, then transfer to a cooling rack. >I made these this week as well, they are so good. 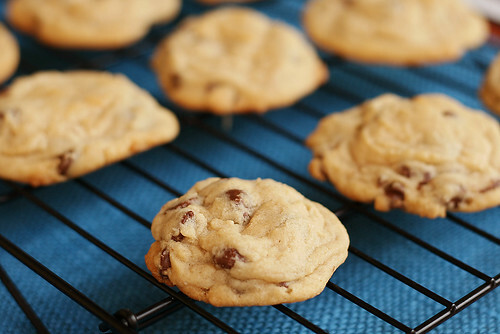 I can never resist trying a chewy chocolate chip cookie recipe. >I'm so glad you liked them. I fell in love after the first bite. It sounds lame, but I've thought about another batch every day since I made them! 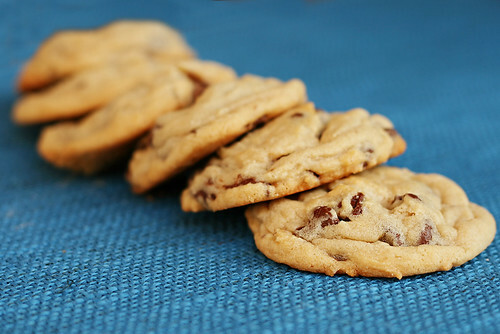 >making these now….if the cookie is anything like the dough we are in for a yummy treat!! >Mmm, just mADR these and I Love the flake of kosher salt every so often. Very easy! Very yummy! Thanks for sharing the recipe. >Just tried your recipe tonight. My cookies spread very thin, like most chocolate chip cookies seem to. I would normally blame it on Houston humidity, but today was a beautiful day! Any advice? Should I increase the flour a little bit? Decrease the butter? >@ Anonymous! Bummer, so sorry your cookies didn't turn out. I'm not exactly what sure happened as that has literally never happened when I've made this recipe. My first thought is baking soda, maybe check the date on your box. Expired baking soda will make cookies spread a lot. Other thoughts would be to maybe add a tiny bit more flour, make sure that your butter isn't TOO soft (you want it soft enough to cream, but not so soft that it doesn't hold it's shape), and try not to over-mix after you add the flour. Oh, and make sure your pans are not hot. Sorry again, I just made these again last night and they barely spread at all! Good luck with trying them again! These are delicious and really quick to mix together. 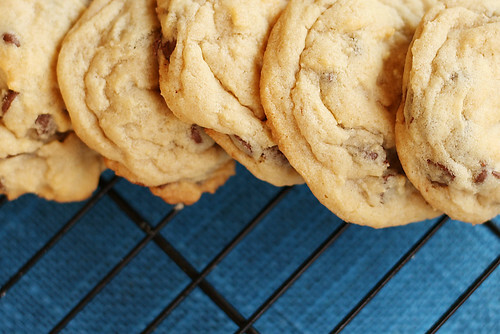 Will become my go-to chocolate chip cookie recipe. THANKS!! !